Sir Elton John has been called "the Liberace of Rock and Roll", for his flamboyant outfits, showmanship, and seemingly endless career. Few performers could match his collection of elaborate costumes, and his trademark outrageous eyeglasses. He was born Reggie Dwight, the son of a former Royal Air Force trumpeter, and his parents divorced when he was just a baby. Young Dwight, raised by his mother, was playing piano by the time he was four years old, and won a scholarship to the prestigious Royal Academy of Music at 11. He studied there for several years, before leaving to pursue his career in music. Dwight formed his first band, Bluesology, in 1961, when he was 14. By 1965, the band was getting paying gigs. In 1966, Dwight tried out as a singer for both King Crimson and Gentle Giant -- neither band wanted him -- and auditioned for Liberty Records -- which didn't want him either. But the record company gave Dwight some lyrics they weren't interested in, written by another unsigned hopeful, Bernie Taupin. Dwight liked Taupin's way with words, and the two young men corresponded through the mail. Their first joint effort was the song "Scarecrow" in 1967, just as Dwight had changed his name to Elton Hercules John, borrowing the names of Bluesology saxophonist Elton Dean and blues-rock singer Long John Baldry. Elton John and Bernie Taupin spent the next year and a half writing songs for pop singers like Lulu. John recorded an album, called Empty Sky and released a few singles, all to a general lack of acclaim. 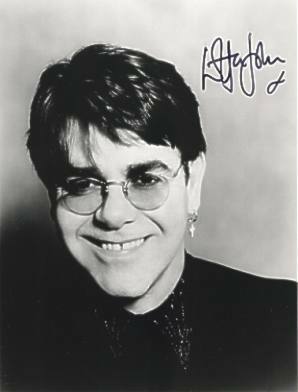 John's second album, titled Elton John, included "Your Song", which shot into the top ten in both the U.S. and U.K. And ever since, Elton John has been one of pop music's biggest stars. He had 30 top 40 hits between 1970 and 1982, with at least one top 40 single every year until 1996, and had seven consecutive #1 albums. Taupin and John have drifted apart and come back together several times since their first break-up in 1976, with toe-tapping an inevitable byproduct. In 1976, John revealed in an interview in Rolling Stone that he was bisexual. In 1989, after four years of being married to a woman, John announced he was no longer bi, but strictly gay. He married filmmaker David Furnish in London, in 2005. John was on friendly terms with Lady Diana. When she died in 1997, he asked Taupin to re-write the lyrics to "Candle in the Wind", a melancholy song about Marilyn Monroe, to make it about Diana instead. John sang the new lyrics at Di's funeral, and while the Princess of Wales rarely wore hand-me-downs in life, her second-hand tribute song was another international hit for John. In 1986, John collapsed onstage during a concert in Australia. Shortly after that, he underwent throat surgery. In 1989 and '90 he was in and out of rehab, fighting drug addiction and alcoholism. By 1991 John described himself as sober. In 1999, he was diagnosed with an irregular heartbeat, and had a pacemaker installed. In 2000, he was criticized for performing a duet at the Grammy awards with rapper Eminem, whose nominated album, The Marshall Mathers LP, included anti-gay lyrics. The very-out John said he had thought it was a conciliatory gesture to gay people from Eminem. Eminem said he hadn't known John was gay. Interviewed by Dotson Rader for Parade magazine, 17 February 2010: "I think Jesus was a compassionate, super-intelligent gay man who understood human problems. On the cross, he forgave the people who crucified him. Jesus wanted us to be loving and forgiving. I don't know what makes people so cruel. Try being a gay woman in the Middle East -- you're as good as dead." Considers himself gay, although he occasionally fancies women. The Sun 24 September 2001: "I can be driving along and see a woman walking down the street. If I like the way she walks or dresses I think, Phwoar! She's gorgeous... The other day an incredibly good-looking woman was interviewing me in Spain. She was unbelievable, astonishing. She was only about 22. Of course I think that even though I'm gay I don't just fancy men."